I couldn’t resist posting a photo of the Roasted Tomato and Summer Squash Pilaf that I wrote about for Bob’s Red Mill (and mentioned in my previous post). 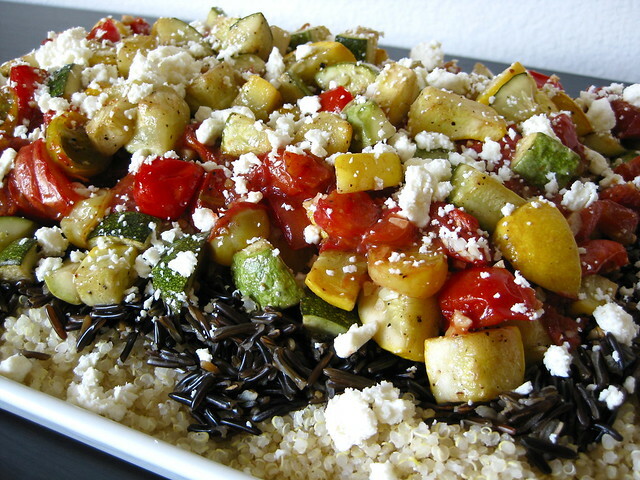 To me, the combination of quinoa, wild rice and a rainbow of assorted summer squash and heirloom tomatoes is so visually appealing. This is one of those meals that I look forward to making every year when the latter two items are abundant — and therefore much, much cheaper — at the farmer’s market. You can, of course, use any brand of quinoa and wild rice here; though, in my experience, Bob’s Red Mill sells some of the highest-quality grain products on the market. It’s no secret that I’m a huge fan of their gluten-free flours — after all, they are what I use in all of my baking recipes (and no, they are not paying me to plug their products). If you’re interested in reading the full recipe, please click here to be redirected to their site.